Etixx-Quick-Step rider Gianluca Brambilla won his first ever Grand Tour stage and claimed the leader's jersey at the Giro d'Italia on Saturday. The 28-year-old, after negotiating the 2016 Giro's only gravel stretch on the climb to Alpe di Poti, launched a solo attack on the run home to Arezzo to seal the win in stage eight with a time of four hours, 14 minutes and five seconds. AG2R La Mondiale's Matteo Montaguti was second, just over a minute back, followed by Moreno Moser of Cannondale Pro Cycling, to complete the first all-Italian podium of this year's race. The 186-kilometre stage cost Dutchman Tom Dumoulin his lead in the general classification, the Giant-Alpecin man unable to keep pace during the demanding sterrato ascent. He is now more than three minutes behind the new frontrunner, who will wear the famous maglia rosa - the first Italian to do so in 2016 - during the 40.5km time trial in stage nine on Sunday. "I can't believe what I've done," Brambilla said. "My idea at the beginning of the Giro was this stage, and I did it. 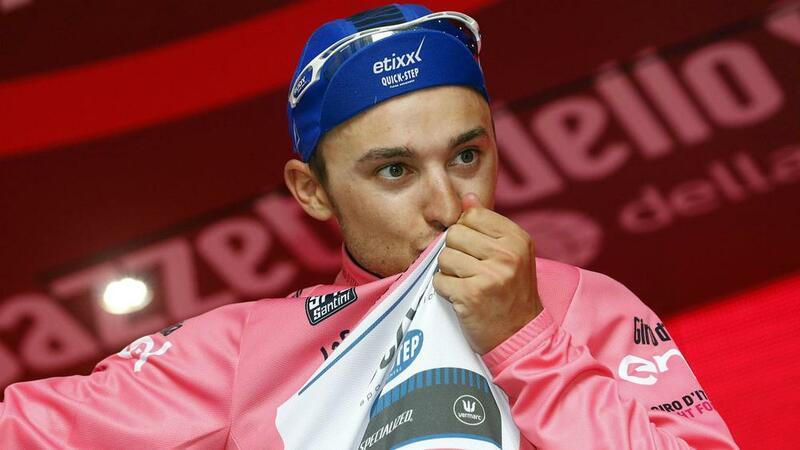 I can't believe I have the pink jersey." Brambilla had been part of an early 13-man breakaway and received plenty of help from team-mate Matteo Trentin, before holding off Montaguti on the flat following the descent from Alpe di Poti. Team Katusha's Ilnur Zakarin is second behind Brambilla overall, with Steven Kruijswijk of Team LottoNl-Jumbo third in the GC. Movistar's Alejandro Valverde sits fourth, nine seconds ahead of Astana Pro Team's Vincenzo Nibali.